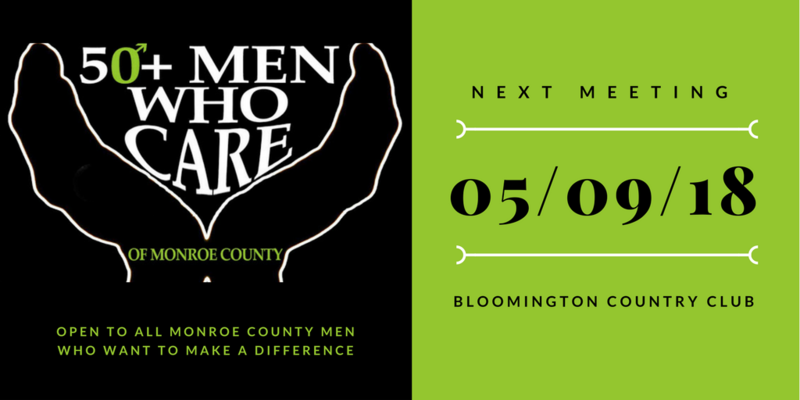 The next quarterly meeting of 50+ Men Who Care will be May 9 at the Bloomington Country Club, 3000 S. Rogers St. This group of local men pools money each quarter to support local not-for-profit organizations. Guests are welcome, and new members may join at any of the quarterly meetings. Socializing begins at 5:30 p.m. with a business meeting to follow from 6:00 p.m. to 7:00 p.m.
50+ Men Who Care is open to all men in Monroe County who wish to support local nonprofit organizations. Each member commits to donate $125 per quarter ($500 per year) plus an annual donation of $100 for continuous funding of a 50+Men Who Care Endowment Fund with the Community Foundation of Bloomington and Monroe County. Quarterly donations will be given to Monroe County nonprofit organizations serving the Bloomington, Ellettsville and surrounding areas of Monroe County. Complete information is available at https://www.fiftymenwhocare.org. Visitors are welcome to attend a meeting before joining.